Whist perusing through my modest negative collection, I ran across a handful of photos taken back east, including Boston & Main and New York Central. Notes on the negative envelope indicate they were shot in 1958, but no mention of who snapped the photo. I have no idea how these came into my possession. I was 15 at the time, and we were living in Prince Rupert. The only thing I can think of was that I must have done a negative swap with someone I met through the advertising section of Trains magazine. 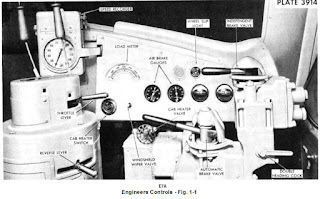 • Following NYC PC merger, became PC 4034. Penn Central went belly-up July 21, 1970. Government formed Conrail to keep passenger and freight moving, but like her sister "B" unit below, doesn't show up on Conrail roster. If you know the disposition of these two units, please share with me. 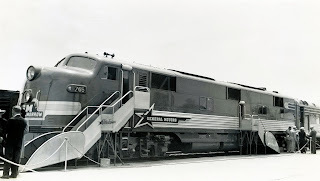 EMD NYC 4112 was an E7B, 2,000 hp (1,491 kW) passenger locomotive. • Following NYC PC merger, became PC 4112. Same fate as 4034. On the brighter side of the E7 story, General Motors went off script, and decided to show the public their new 2,000 hp passenger locomotive, towing the first dome cars to enter rail service. As the legend goes, a vice president of General Motors was impressed with the view from the cab of an E7. 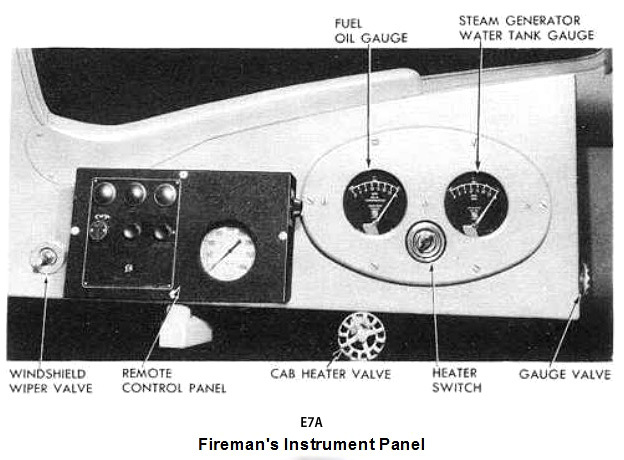 He challenged his technical staff to design a "car with a view." Working with tekkies at Pullman-Standard, the Astra Dome was conceived. The cars were semi-permanently coupled, with fairing to emphasize "streamliner of the future," and assigned lyrical names. 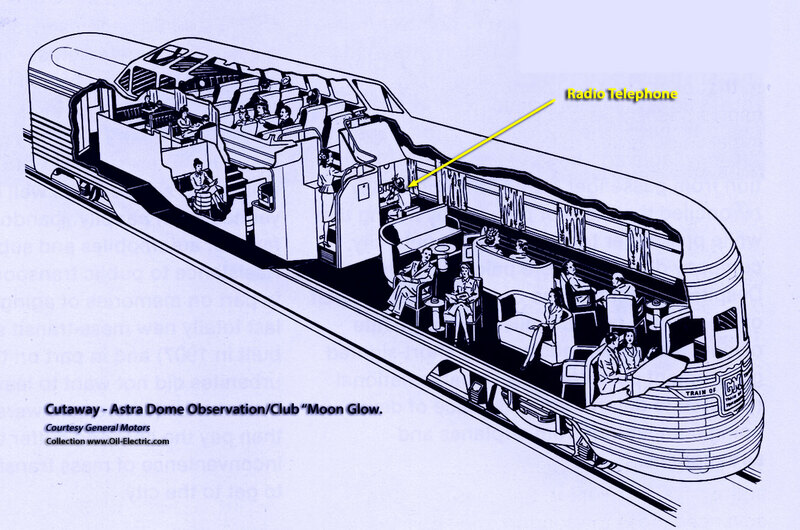 • Dome coach named "Star Dust"
• Dome diner named "Sky View"
• Dome sleeper named "Dream Cloud"
• Dome observation lounge named "Moon Glow"
• UP converted to E8 specifications, 2x EMD 12V-567B, 2,250 hp, (1,678 kW), 1964. • AMTK 417 shows up again in a scrap yard. 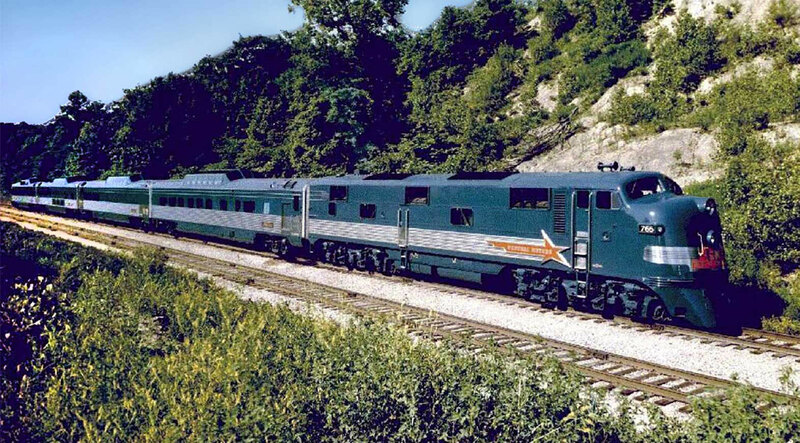 The "Train of Tomorrow" cars and matching locomotive were painted a silverish shade of blue, with stainless steel fluted panels bolted on to give the train an added taste of modernity. Completed in May, 1947, GM dispatched it on a transcontinental tour, announced to the public with a two page spread in Life Magazine, June 16, 1947. 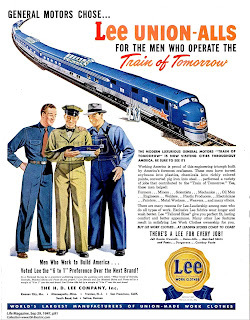 • The "Train of Tomorrow" began its tour of the US and Canada on June 3, 1947, ending in Chicago October 30, 1949. 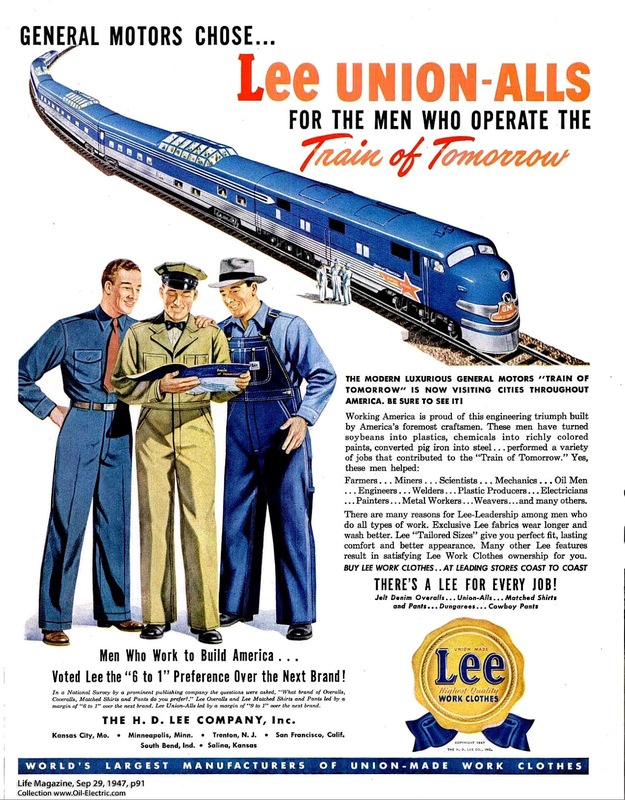 • The "Train of Tomorrow" traveled 65,000 mile, covering 28 states. 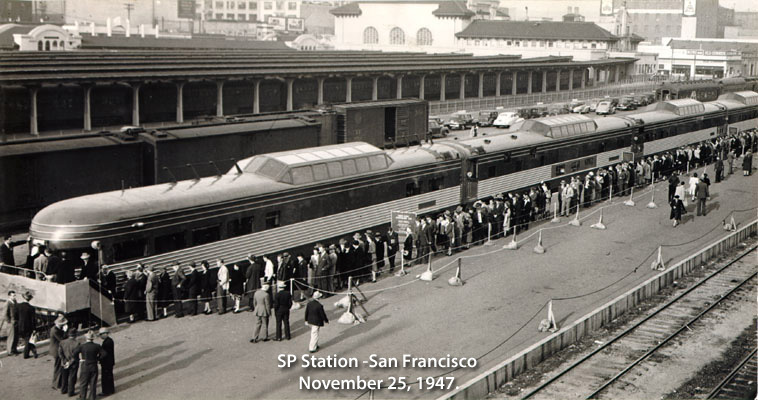 • An estimated 6 million visitors rode or stood in long lines whilst on static display. 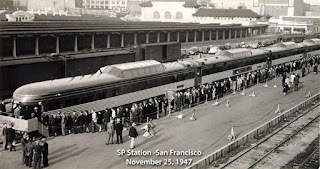 I have not been able to verify this; but I ran across a photo of the train with a Pullman-Standard green baggage car attached. 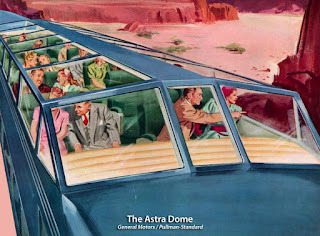 This to carry baggage of passengers on some press runs, as no Astra Dome baggage car was conceived! 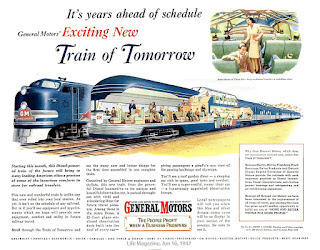 • General Motor's invested US$1.5M to build the Train of Tomorrow, in 1947. 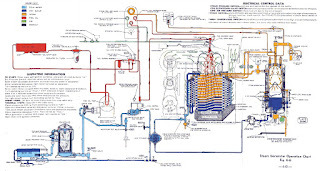 Today, the project would cost GM US$16M plus change. The U.S. dollar saw inflation at an average rate of 3.50% per year between 1947 and 2016. 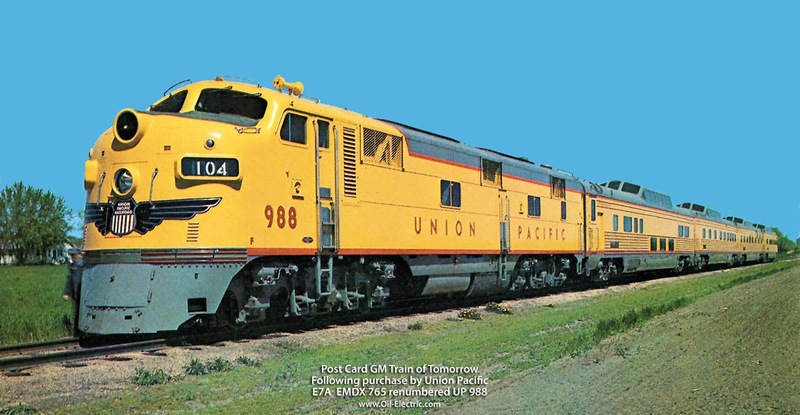 The entire "Train of Tomorrow" was purchased by Union Pacific in April 1950. 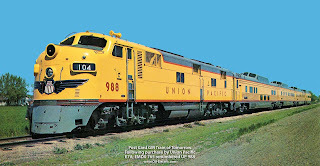 Following re-paint, the locomotive and cars went into service between Portland, Oregon and Seattle, Washington on schedules 457 (northbound) and 458, beginning on June 18, 1950. • Baggage, mail, express cars. 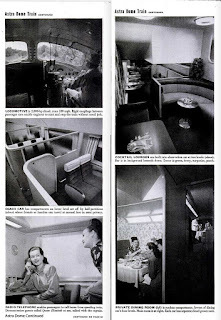 • Five or six 48 seat chair cars. • Northbound, a sleeper car from the Chicago to Portland "City of Portland." • Dome coach "Star Dust," $9.49. 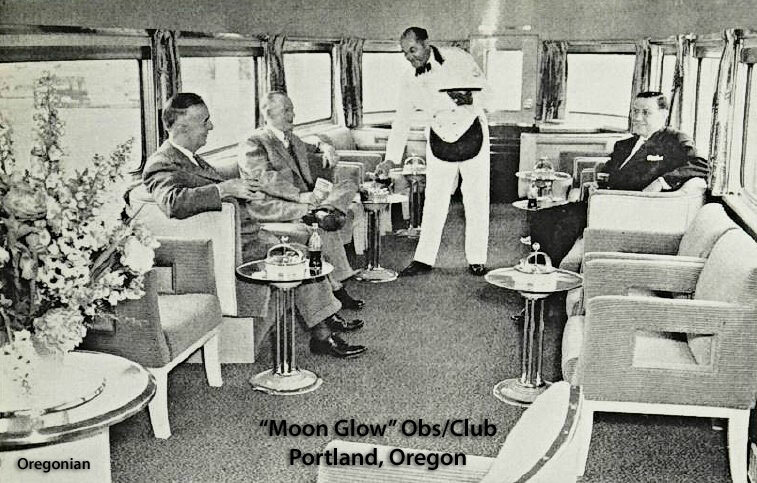 • To ride the dome sleeper (referred to as "suites") $15.65, which also included access to the domed club/observation car, "Moon Glow." And according to a report in the Oregonian, that was $2.64 less that riding a DC-6 between PDX and SEA. 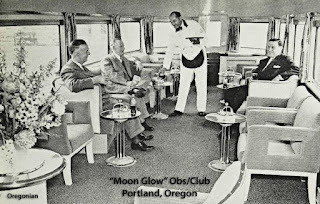 Of the four original domed cars, only the observation club car "Moon Glow" escaped the cutter' torch. Seen here, having been pillaged by scrap hunters, in Ogden Utah, 2011. But there is a happy conclusion. 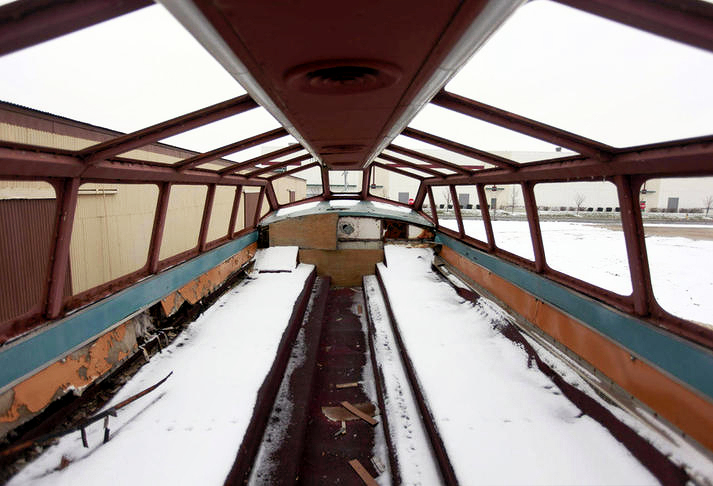 The Union Station Foundation in Ogden has established a plan to salvage this priceless piece of railroad history. 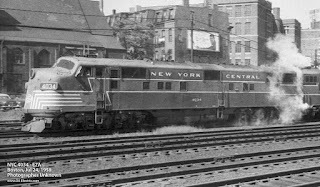 • Ric Morgan has written "Train of Tomorrow," considered by many as the "essential" history of the train. Available through Abe's Books and other outlets. • General Motors "promotional short," shown in movie theaters. • "Inspection" Train of Tomorrow. • "Preserving the Moon Glow Car" Domed observation/club car, Train of Tomorrow. 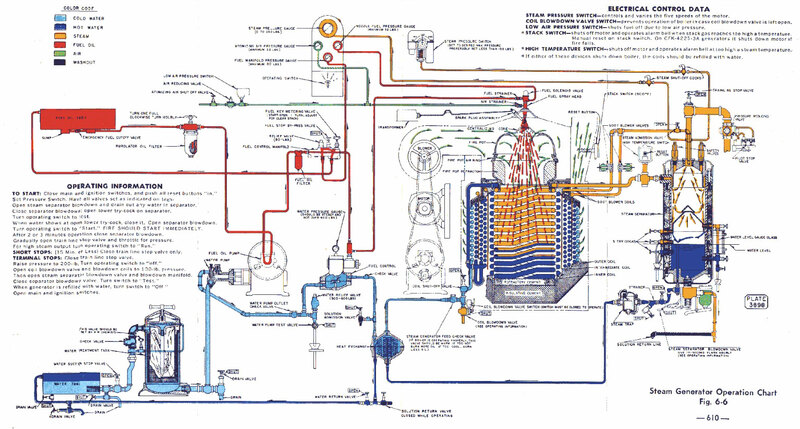 • "Moon Glow Restoration" Removing components to safe storage. 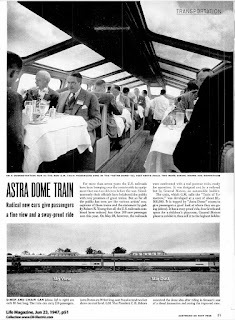 • "Riding Train of Tomorrow" Black and white, no sound, but great views inside Astra Domes!